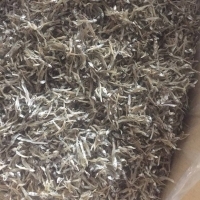 Send a buying inquiry to Wholesale Dried Anchovy Fish, from Phulimex Co., Ltd., Viet Nam. Product Id 880346. 1. Size : 2 - 3cm, 3 - 4cm, 4 - 6cm, 5 - 7cm, 8 -10cm 2. Moisture : 15% 3. Salt : 3 - 8% 4. Shelf life : 24 months 5. Packing:5 kgs - 10kgs/ ctn, PE vacuum bag or at buyerâ? ?s request 1/Packing: + 10kg net/carton with PE inner + 8 MTS/20 Feet, 16 MTS/40 Feet Payment term: 100% LC at sight OR 30% TT advance, 70% after copy of shiping document.